After being celebrated as America’s first trillion-dollar company, Apple’s stock has suddenly started to go down. I’ve been saying for a while now that Apple’s business is in decline, and that it’s struggled to innovate after its revolutionary co-founder Steve Jobs died back in 2011. At its core, Apple’s business is made up of its iPhone sales. But the thing is, iPhone shipments actually peaked five years ago, and have been trailing down ever since. To make up for that lack of revenue, Apple keeps increasing the price of its phones. But, as I’ll explain in today’s video, that higher price tag will have negative, long-term ramifications for this iconic company. And price inflation is just one of three major problems that Apple’s currently facing. To find out exactly why Apple’s business will continue to decline, and why you need to sell its stock out of your portfolios today, check out the video below. Hi, this is Paul with your Winning Investor Daily. Because, as you can see from the stock chart (below), after going up and being celebrated for a little while as the world’s first trillion-dollar company, Apple has suddenly started going down. The whole thing began after it announced its results for the last quarter. It showed the world that its iPhone business — which is really the most important part of Apple — is struggling. And, for this video, I’m going to get into the business of Apple instead of speaking to the technology. If you’re interested to know what I’ve been saying about its issues with technology and innovation, you should check out my previous articles where I’ve laid out my case for why I believe Apple has fallen behind, and why I believe that could be a massive problem for Apple. However, in this video, I just want to go into business elements on why I believe that Apple should be sold. And, yes, I see that it’s gone down by something like 20%. And, yes, I am aware that the world’s greatest investor, Warren Buffett, owns something like $40 billion worth of this stock. However, I can also tell you that Apple’s critical business is its iPhone. As you can see from the chart below, which shows shipments — shipments meaning units — in other words, if Apple sells 100 units, that’s recorded as a shipment. You can see that its shipment peaked quite some time ago — more than five years ago. So, how has Apple managed to make all this money and stay at the very top of the smartphone market? The answer comes from this price chart that is done by this very good research company. And, we’ve shown you this tweet that was put together by Horace Dediu. He shows you that, when the iPhone was first introduced, the base price was $400. And, of course, once you put in the additional features, it got much higher. However, today the base price is well over $1,000 and the top price is nearly $1,500. And, that answers the question that I’ve posed to you, which is: How has Apple stayed at the top of the smartphone market when they have so little value when you consider the total value? It’s because they have increased the price every single year. And, for sure, the jump from Apple’s original iPhone from the second, third and even fourth generation felt more than worth it. And, personally, I’d been using iPhones myself, all the way until the iPhone 6. And, I felt that even though the innovations and iterations were small, it was worth paying for. However, I have absolutely felt that for the last many years — certainly, since Steve Jobs’ death the innovation has declined. The price increases are greater than they ever were for less, in terms of true innovation that really matters — things that I would use every day and would generally make my life easier and better. And, there is a problem that Apple has created for itself because, if shipments are going down and prices are going up, it’s telling you that it’s unable to sell as many of the phones that it could at lower prices. Apple has been stumbling around trying to find a new way to keep its growth and its business growing. And, its CEO, Tim Cook, has made this bet on trying to lock people in to the iPhone. They’re trying to make it very difficult for you to leave their platform. What he has tried to do is build the suite of services around it — Apple music and its cloud platform. Thus far, it’s clearly not working, being that its shipments continue to move down. In other words, moving prices up has become a major issue for Apple. And, there’s another problem that Apple faces, which is that the smartphone market, of which Apple and Samsung both have the largest share, is now a mature and slightly declining market. As you can see from this last chart, you can see that the smartphone market is expected to decline. And that poses a major sector risk for Apple because they would need to be able to gain market share while trying to raise prices. That poses a problem that I believe is currently priced into Apple’s stock, which is why I have been negative on Apple for some period of time because I anticipated a lot of these risks to be priced into Apple’s shares. However, in truth, I never expected Warren Buffett to bring $30 billion or $40 billion to come in and bid the stock up from something like $100 to something like $180. So, at this point, unless there is some new way of growth that is going to show up in the next six to twelve months, I would expect Apple’s shares to go down slowly because of the fact that Apple does have hundreds of billions of dollars in cash. So it could buy back stock as its stock drips down. And, it’s completely possible that Warren Buffett may step up and buy even more shares. Also, Apple’s shares do pay a dividend. There is a substantial market among people who own Apple’s stock because it is a beloved company. And, the iPhone is still a beloved product and lots of people still make decisions on what stocks to buy on that basis. However, sooner rather than later, every stock ultimately reflects its business. And Apple now has three things going for it that are going in the wrong direction. It’s raised prices when it has no business justification for doing it. And, business justification would be, innovation, convenience and design — Apple is behind on all those fronts. 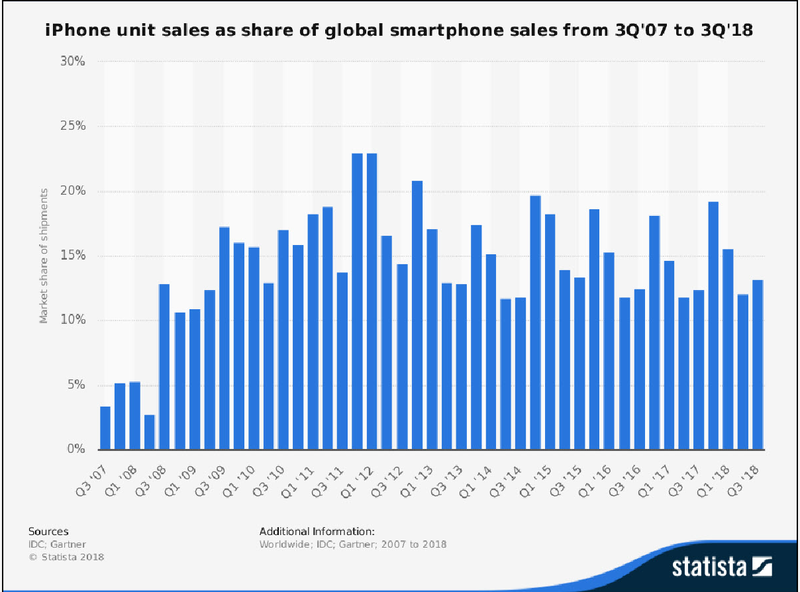 It is losing market share on its lowest end phones to Chinese manufacturers like Xiaomi, Huawei and Oppo that are taking share in global markets. So, that represents a big deal. Finally, the overall smartphone market is now mature and going into decline. So, for all of these reasons, I would tell you to stay away from Apple’s stock even though it has gone down by 20%. And, while it’s unlikely that Apple’s stock is going to collapse overnight, or in a week or a month, I believe that Apple’s stock will continue to decline because its business is in a decline. So, that’s my Winning Investor Daily for you this week. It’s about Apple and me saying that I believe that Apple’s stock will continue to go down in the medium to long-term. 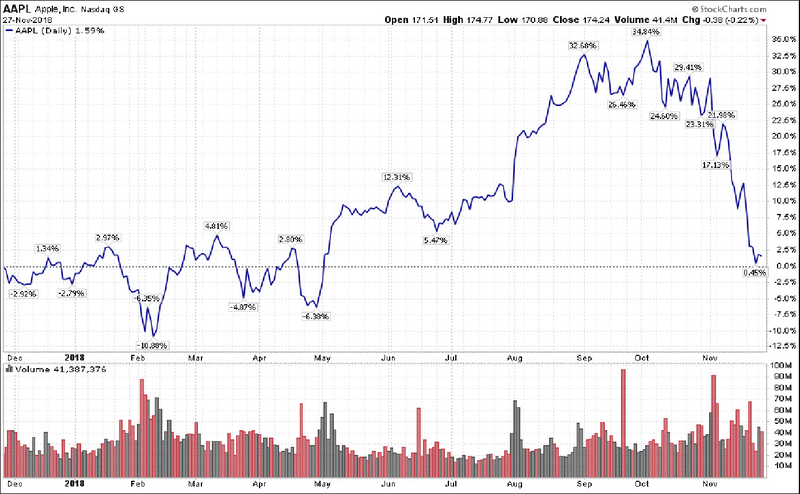 In the short-term, buybacks and Warren Buffett could keep it at these levels or even move it slightly higher. So, I’ll have another video for you next week. Until then, this is Paul saying bye. One of the traps that people fall into when they build their portfolios is modeling what big-name investors buy into. Berkshire Hathaway CEO Warren Buffett, for example, owns something like $40 billion worth of Apple stock. But he also confesses to using a flip phone and being “out of touch” when it comes to using Apple’s phones. That’s a big problem. It means that Buffett doesn’t clearly understand the company he’s sunk his money into, or what the needs are of other people using Apple’s products. So, please, don’t buy into Apple just because you hear that Buffett likes its business. Instead, focus on putting your money into companies making true innovations. I talk about many of these revolutionary companies in my Profits Unlimited newsletter. So if you’d like to learn more about them, I recommend looking into that service. That’s all I have for this week. However, I’ll be back next week with another Winning Investor Daily.